A Life of Sugar and Spice: Today's the day!! The gluten-free cooking spree is today!!! I can't wait. Since I don't have to be there until 5, I've spent the morning just hanging out and cooking. I made my first attempt at oatmeal. I failed miserably. It was horrible. Not cooked enough. YUCK. So I dumped it and had cereal instead. 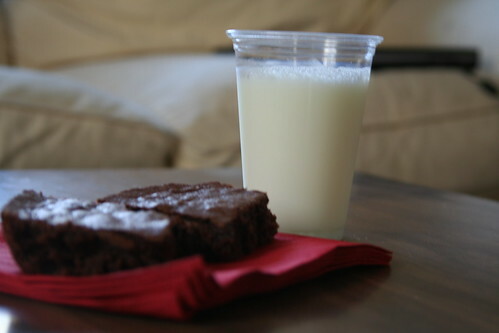 Then I sat around watching Food Network and trolling the internet and suddenly felt inspired to bake brownies. I had all the ingredients on hand so I set to work. I used GF Steve's recipe again, it's now my old standby and I love it. I used canola oil this time instead of olive oil and I liked the flavor better. I also cooked them a little less time and they were more gooey and yummy. I also was more careful about paying attention to the steps of the recipe. This is definitely the best batch I've made so far. Now it's almost 11:30, I'm still hanging out in my pajamas, and I'm debating over what I'm going to do before I have to start getting ready for the cooking spree. Probably have another brownie. Maybe I should finish up my schoolwork and get it uploaded so that I don't have to worry about it tomorrow. Yeah that sounds like a pretty good idea. I'll be back to recap the cooking spree tomorrow or Monday. Have a great weekend everyone! !